Developed by creators of the main Pokémon series Creatures Inc., a studio owned by Nintendo, the Japanese video game company’s first paid app for iOS has today hit the iTunes App Store called Pokédex, notes the Eurogamer (via MacStories). 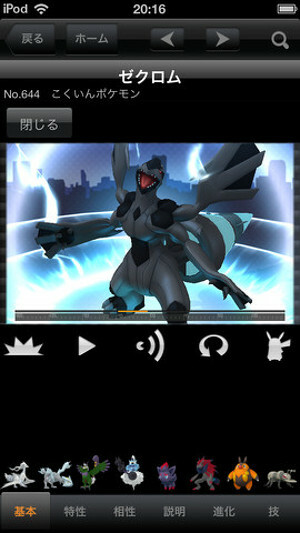 The universal iPhone/iPad game is a version of Nintendo’s existing Pokédex app for the 3DS. Nintendo has been long expected to start bringing its most popular franchises such as Mario and Zelda to the iOS platform. While the company itself has been devoted to creating games only for its own hardware, it has now started allowing other platforms and devices to use its brands and characters. The Pokédex game has initially been released in Japan only and also comes with in-app purchases. Once downloaded you’ll find a version of the Pokémon encyclopaedia which covers all of the latest generation of critters (from DS games Pokémon Black and White). This costs 170 yen (about £1.30). Four extra packs with monsters from previous generations are then available to download for 500 yen (£3.90) each – meaning users will pay around £17 for the whole thing. Let’s hope Nintendo considers bringing its more popular titles to the iPhone/iPad in near future.